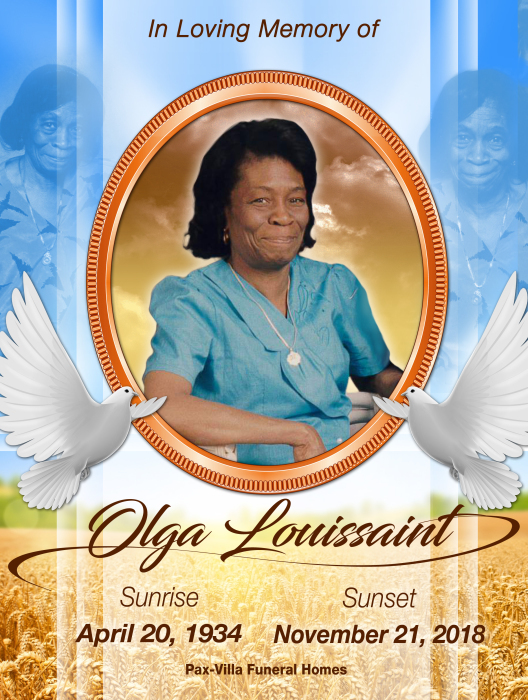 Olga Louissiant was born on April 20, 1934 in Port au Prince, Haiti, the only child of the Ms. Venicia Louissaint and seventh child of Mr. Marcius Simon. She attended Venezuelian Republic Secondary School and became a seamstress. Diligent and industrious she continued her profession. Later, marrying Mr. Alex Morancy in Haiti. Blessed with her son Gerard Louissaint, daughters, Margareth Morancy, Anne Marie Michelle Morancy and step-daughter Alexander Guillaume. She migrated to the United-States with assistance from her eldest son Gerard. During her time, she worked as a bus matron in Rhode-Island and a home attendant in New York City up until her 80'. After many discussions, she finally agreed to retire in her home, which she purchased in Orlando. “Our Mom was a loving and hard-working woman, who did anything for her children and family. Working long strenuous hours to feed and provide a home for her family. She taught us the value of money, hard work and the need to establish goals in life with achievement." as per Gerard. Although a private person, she would never miss phone calls to family and friends for the holidays and birthdays. She enjoyed country and gospel music. No one could forget her favorite show "Gilligans Island". On Wednesday, November 21, 2018, our loving Olga Louissiant, otherwise known as " AnneMarie" was called Home to be with the Lord. Olga will be missed and cherished in our hearts forever. Her great-grandchildren: Anne Isabelle Auguste, Dorine Auguste, Noah Page, Jayden Steve Morancy, Alea Malaika Morancy, Edison Louissaint & Elizabeth Louissaint will keep her in their hearts forever. family and will be missed by all her nieces and nephews. Condolences to the families: Roman Elician, Rudel Simon, Ann Therese (Valentine) Fabien, Eltine Despinosse,Ginette Simon, Pierre Marcel Simon, Marsha Bolton, Geraldine Simon, Marie Dominique Johnson, Maryse Houndo, Marjorie Guiteau and Wendy Dolce.